How Many Shots Are in a Bottle? One of the few times you need to use math in the bar is when you need to know how much liquor to stock. That requires knowing how many shots you can pour from the standard bottle. Whether you are stocking a bar or planning a party, a few charts will help you estimate how much liquor and mixers you will need to have on hand. 1 1/2 ounces (the average shot) of a base liquor (e.g., vodka, gin, rum, etc.). Liqueurs are typically poured at 1/2 to 3/4 ounce. Accent juices (such as lemon and lime) usually use 1/4 to 1/2 ounce. Filling a highball or tall drink with juice or soda often requires 4 to 6 ounces. With this information and the recipes you intend to serve, you can estimate how many bottles of each liquor you will need to create a certain number of drinks. 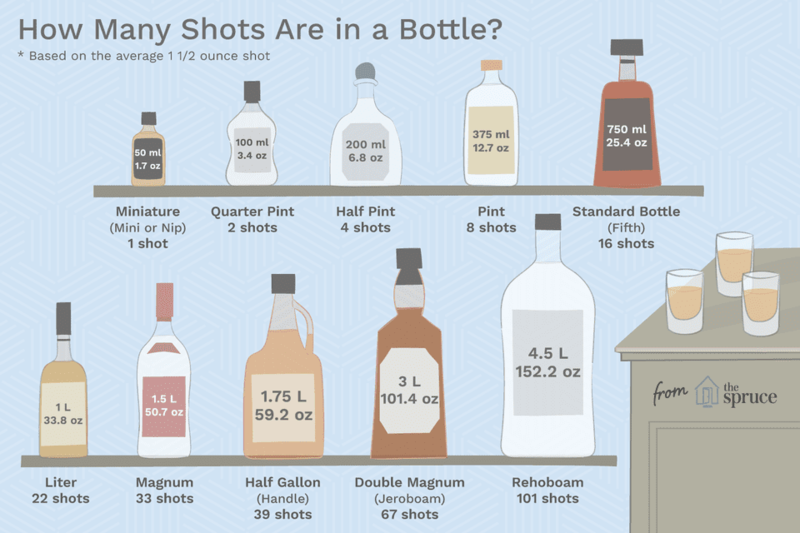 This chart represents popular bottle sizes in both metric and U.S. measurements and the average number of standard shots each will produce. **Based on the average 1 1/2 ounce shot. Mixers such as juices, syrups, and sodas are not quite as easy to estimate because there are no standard bottle sizes. However, mixers are less expensive than liquor, so it's always a good idea to overstock rather than be unprepared and run out. The next chart includes the average pour of a mixer if it is included in a cocktail recipe. Of course, not every drink is going to use each type of mixer and some use more or less than others, so this is just a general guide. For instance, you may be mixing a cosmopolitan that requires 1/2 ounce of lime juice, but if you offer a whiskey sour, you will need a full 1 1/2 ounces of lemon juice. Likewise, tall drinks like a gin & tonic will require 4 or more ounces of soda to fill the glass while a booze-filled highball like the Long Island iced tea may need just 1 ounce of cola or less. The average soda bottle or can is 12 ounces, so estimate two to three drinks per container. Two-liter bottles are a cost-effective option for the more popular sodas and there are about 67 ounces per 2 liters. Other mixers like bitters are easy. One bottle of each required style will be more than enough (even lasting many home bartenders years). If you are you going to use fresh citrus juice, this chart will help you decide how many lemons, limes, and oranges you will need. There are a couple of tricks to maximizing the juice yield of your citrus fruits. First, let the fruits reach room temperature if you store them in the refrigerator. Then, before cutting the fruit open, roll it between the palm of your hand and the cutting board, pressing firmly but not enough to squash the fruit. Keep in mind that juiced fruit will not be usable for garnishes. Have extra produce on hand to cut wheels, wedges, and twists for your drinks. Garnishes can be prepared ahead of time; store sliced fruit in sealed containers and peels or twists in ice-cold water to keep them fresh. Do You Know the Shelf Life of Your Liquor Cabinet? How Much Does It Cost to Make a Cocktail? How Strong Is Your Drink? Know What Kind of Drink You're Ordering: Well or Call? Need a Little Hangover Remedy This Morning?